“The essential content of the Faith, then, includes first of all the glorious Gospel of the blessed God, which covers the whole many-sided reality of the divine plan and work of salvation. Secondly, the Faith includes the sound doctrines of the truth that properly accord with that glorious Gospel. It includes thirdly the Way of living that conforms to those doctrines. And fourthly it includes the experience of all the life-giving benefits that flow from the power of the Gospel and enable us to walk in the Way of the Lord. The last three of these elements may be regarded as three facets or dimensions of the Faith that derive from the Gospel” (121, emphasis added). 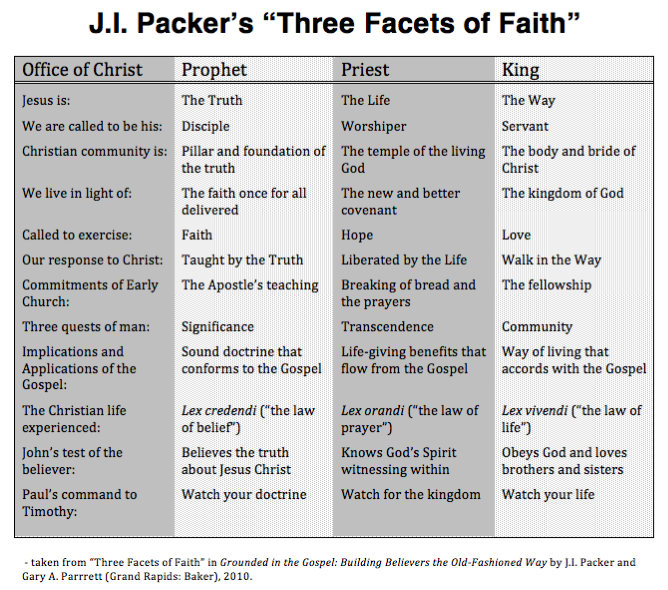 So Packer argues that the three facets of faith are the truths to be believed, life to be experienced, and ways to conform our lives. Anyone familiar with Scripture will see that Packer is pulling from John 14:6 where Jesus defines Himself as the Way, the Truth, and the Life. These three facets inherent to the Gospel, Packer argues, are confirmed from three witnesses, namely they are “historical affirmed, biblically grounded, and psychosocially validated”. Similar to the “multiperspectivalism” of Poythress and Frame, Packer believes there is “sufficient biblical warrant for a multifaceted approach to the content of our teaching ministries” (127). He argues, “When we take the testimony of these various witnesses together, we see how the glorious Gospel of Christ and the three dimensions of the one Faith speak powerfully to the deepest of our human needs and desires” (130). Packer agrees with Frame/Poythress that the multiple perspectives or “dimensions” (or facets) are not intended to be viewed in isolation but rather comprehensively and holistically. He explains, “These facets overlap and interrelate, and we therefore make no overly fine distinction between them. But we do well to name each of the three facets so that we may better understand and apply ourselves more effectively to them” (ibid.). In summary, Packer provides the relational claims of each facet to the whole of the gospel this way. We proclaim Christ who is the way, the truth, and the life, and who is our prophet, priest, and king. Each one of us is called to be a disciple, worshiper, and servant together with all the saints who make up the pillar and foundation of truth, the temple of the living God, and the body or bride of Christ. As such, we are called to live in light of the faith once for all delivered, the new and better covenant, and the kingdom of God, exercising faith, hope, and love as those who are taught the Truth, liberated by the Life, and walk in the Way. Below is an attempt to reproduce a portion of the chart provided in Packer’s book. Click on it to enlarge the image. What you will see is a fine example of triperspectival thinking from one of the towering theologians of our day. Enjoy.